everyone’s having a wonderful day. 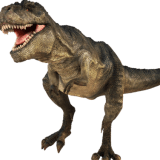 There’s old Tee Rex standing all alone. made out of plastic and stone.